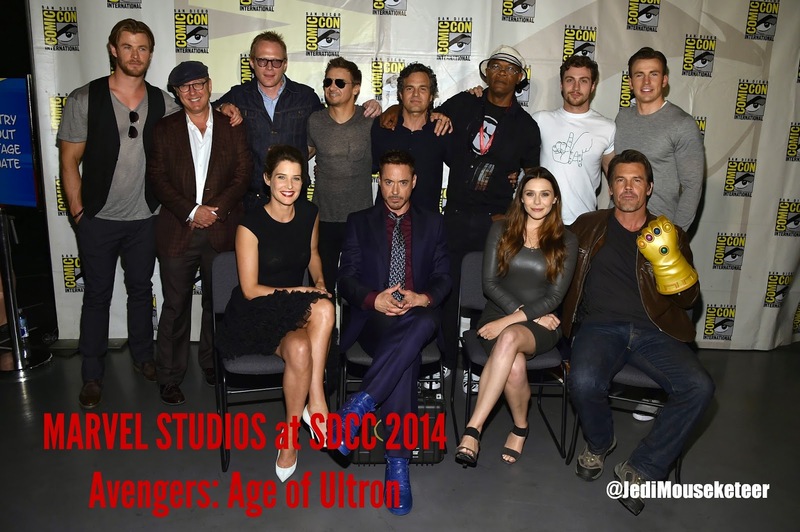 Here are some great photos of the Marvel Studio panel in Hall H at San Diego Comic-Con International 2014. The cast of Marvel's Avengers: Age of Ultron were on hand to talk about their Comic-con experiences as well as give a glimpse of what fans can expect from next year's summer blockbuster. They also showed a new trailer for the film made exclusively for con attendees! Marvel's Avengers: Age of Ultron opens in U.S. theaters May, 1 2015! Robert Downey Jr. (Iron Man) greets the fans with thunderous applause! Hear more about Disney, Marvel, ABC and Star Wars from San Diego Comic-con on WDW Tiki Room this Friday 8 a.m. & 7 p.m./eastern on Sorcerer Radio! Podcast coming soon to WeBeGeeks Network! Mark Ruffalo (Hulk) and Chris Hemsworth (Thor) talk about working on the set. The Avengers must assemble to combat the threat of Ultron! Marvel's Avengers: Age of Ultron opens in U.S. theaters May, 1 2015! Cobie Smulders (Maria Hill) and Samuel L. Jackson (Nick Fury) pal around. Kristen Hoetzel of http://MagicalJourneysVacations.com/ - Book your Disney vacation or cruise today! WDW After Dark - Weekly Webcast for Adult Disney Fans at http://www/WDWAfterDark.com. Josh Brolin (Thanos) accepts a rose from Robert Downey Jr. (Iron Man). BONUS FOOTAGE - See the cast of Marvel's Avengers Age of Ultron and Ant-Man talk about the Hall H presentation on the Jedi Mouseketeer YouTube channel! These photos were made available to Jedi Mouseketeer/Sorcerer Radio Network by Walt Disney Studios Publicity and is used with by permission. SEE ALL THE PHOTOS on the WDW Tiki Room Facebook page! Post by WDW Tiki Room.